Native American fashion designer Patricia Michaels continues to move forward on Project Runway, the Lifetime reality show focused on spotlighting the fun and difficult world of fashion design. The challenge for the 9th episode was the Lord & Taylor challenge. The contestants must design for Lord & Taylor while keeping in mind the concept of the iconic Lord & Taylor style. The winner will have their design reproduced and sold in stores and online through Lord & Taylor, and the loser will be sent home. 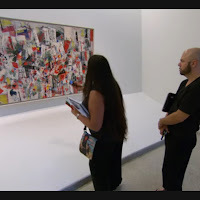 For episode 10, The Guggenheim serves as the latest inspiration for the design teams who take in all the art to create their own print textiles for their garments. The designers are paired again, and one designer is tasked with creating the 'avant-garde' piece while the other teammate must translate that to ready-to-wear. The top six designers wander the Guggenheim, taking notes, pictures, and sketching ideas. Clearly, Patricia would create the avant-garde piece, while the boring one-trick-pony Jersey Fabric king Mr. Richard would complete the ready-to-wear piece (and by 'complete' I mean procrastinate, spend a day creating a bracelet, and then blame Patricia for his lack of inspiration). 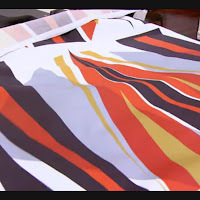 The two come together to make the fabric, clearly inspired by the art in the Guggenheim, yet conveying both the textile artistry of Patricia and the color-blocking of Richard (below). The print is actually a stylized eagle feather construed in bold triangles using colors that are 'tribal' without being tribe-specific. While Patricia tries to convey her vision to Richard, he seems uncooperative. He plays the "I'm waiting on Patricia" card repeatedly, setting her up to take the fall if they land in the bottom. Tim even calls it. Patricia is an amazing textile artist. This is her challenge. The only thing that could bring her down is Richard. And that's what he does. She states, "I have been creating textiles for over 20 years, and if I go home on the challenge that is dedicated to textiles, I seriously am going to lose my mind." Interestingly, Patricia's 'identity' on the show has shifted almost completely to her being 'the artsy one' versus her being 'the Native American one.' This is quite extraordinary, since this type of 'identity' isn't imposed on anyone else (even though we as Native folks are always extremely proud to be the 'Native American one'). 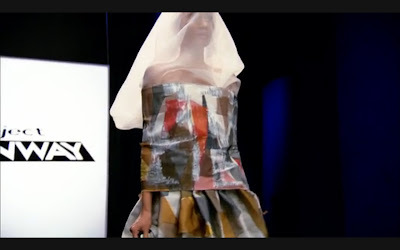 To clarify what I'm saying, for example, no one states, "This is our first gay contestant," or "This is our first black designer" or "I know you're Asian, but please don't do Asian prints, that's so overdone." For her piece, Patricia gets rid of the arms to make an art statement - this garment doesn't have to function. This is an art piece, she doesn't have to have sleeves. Patricia also covers the model's face in a veil to emphasize the idea of androgyny. 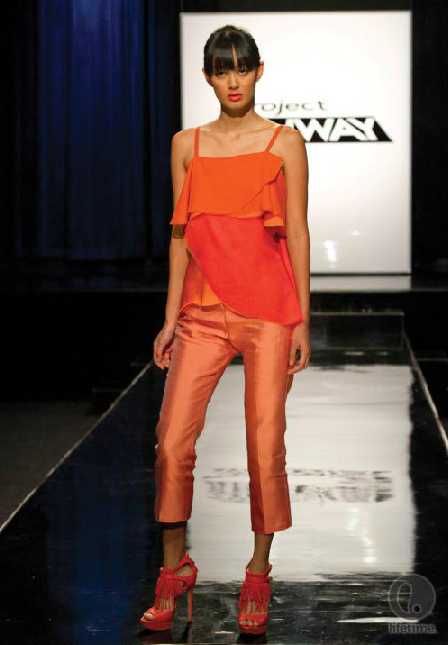 Overall, her piece gets high marks and positive reviews from the judges and Project Runway bloggers and past contestants. 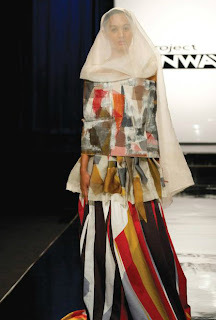 Nick Verreos writes, "Patricia (the artsy one) is in her zone with this challenge; she’s known for creating her own textiles so this is right up her (design) alley. I actually liked Patricia’s look, especially her presentation. I appreciated the avant-garde-like aspect of her design; it was conceptual, thought-provoking and I got it. And I was happy to see that Heidi did too." Mila Hermanovski wrote, "Patricia and Richard. Oh dear. 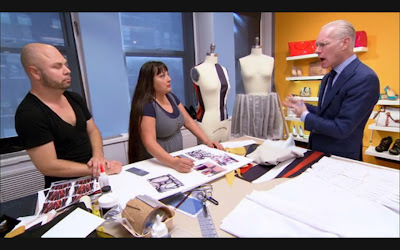 I feel so bad for Patricia because she is a true artisan, who probably feels excited and right at home in this challenge, and she has been teamed with someone who has zero creativity. At first youʼd think that it could be good, right? She takes the reigns and makes the super over-the-top piece, while he makes the watered-down, ready-to- wear piece inspired by hers. Well, Richard was a deer in headlights at the museum, finding nothing inspiring in a building full of inspiration. Oh dear. I lovelovelove Patriciaʼs bold, painterly, large scale print. Richard is simply paralyzed again by Patricia's creation, not knowing what to do partially because she canʼt articulate what she is making...and partially because he canʼt use jersey! So, he spends the entire first day making a bracelet. And the quote of the week goes to Patricia: "You scared of my piece? GOOD! If I instill fear in you, at least you FELT something!" Suddenly I really love Patricia." Click here to watch Project Runway episodes online, and click here to see Patricia's online portfolio.